Sagunthalai was separated from her daughter in 2009, during the final stages of war, at Mullivaikkal.” Security forces separated the parents and children of displaced families and we were taken to different camps,” she says. Longing to be together with her daughter wherever she was, Sagunthalai says she had requested to be reunited with her child through the authorities. “Everything was working out and she was finally coming to Ananda Kumaraswamy camp to be with me. But, on her way there, she was arrested by the CID,” Sagunthalai says, pain etched between the wrinkles of her aged face. That was the last time she heard anything about her daughter. Nearly a decade after the war ended, families of the disappeared are still waging a different kind of war. Inside the Kilinochchi roadside tent, these families have been demonstrating for a year now, activists say, but the authorities have still been unable to come up with answers or provide closure. Two weeks ago, the Government finally set up the Office of Missing Persons. Legislation to set up the office was passed nearly two years ago, and the delays to set up the mechanism which will be a permanent office with an open-ended timeline to investigate disappearances and trace the missing, caused endless frustration for families of the missing and activists working with them to find answers. Sagunthalai explains, as a widow, she worked hard to raise her daughter from the time she was very young. “I worked odd jobs, worked paddy fields, to provide for her. I endured harsh conditions to raise her. Now, I have no strength left in my body to work any more, and she is not there to look after me,” the aging mother says. 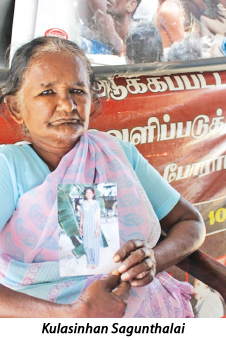 She has received no financial or welfare support from the authorities and survives on assistance from her siblings, Sagunthalai told the Sunday Observer in Kilinochchi, last week. It has been little over a year since the families started their demonstration by the roadside, determined that they would not leave until they got some answers. With answers about the thousands of the missing still unavailable, some of them may never go home if the demonstration continues. “During the time we have been here, around seven people have passed away by contracting various ailments. We tend to fall sick often because of the warmth and dust inside the tent,” said Muttan Devindran, a hopeful father awaiting his lost son. The tent is covered on three sides by polythene table cloths. Through seasons of rain, sun and wind, the families of the disappeared camp out in this former LTTE held town. But demonstrators admit their numbers are shrinking over time. Devindran says, people are afraid of remaining in the tents and falling sick. Therefore, they have moved back home. At the beginning, there were two tents full of families of the missing, he says. Today, only one tent remains. “We contract various ailments while in this tent. I also have some sort of an allergy,” says Sagunthalai pointing to blackened scars on her face. 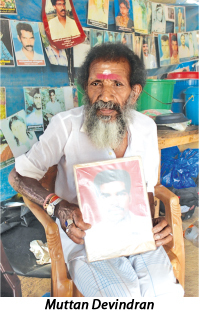 Devindran says his son was conscripted by the LTTE and was injured during the war, shortly before he disappeared. Security forces had then removed his son from the war zone for treatment at the Vavuniya Hospital, the man explains. “An acquaintance who was taking treatment in the hospital at the time told me that my son had sustained an injury on his leg. But then he was transferred to another hospital later,” he says. Subsequently, Devindran received a message from a prison guard at Welikada Prison, saying that his son’s name had been on a prison list. When a family member went to verify the claim, his son was no longer there. “Then I heard from someone that he had been in a rehabilitation camp, but I don’t know where,” the man says, tears welling in his eyes. President, Maithripala Sirisena recently appointed members to the OMP, which began operations early this week. Chaired by President’s Counsel Saliya Pieris, the key tasks of the Office includes, tracing missing and disappeared persons, clarifying the circumstances in which the act took place, protecting the rights and interests of those missing/disappeared and their next of kin, identifying avenues of rectifying for those affected and making recommendations to the relevant authorities to prevent the recurrence of such incidents. But, families of the disappeared remain skeptical about the Office. Leader of the Disappeared People’s Family Union, Yogarasa Kanagaranjani says, the setting up of the Office did not fulfil their expectations and that they had very little confidence in it. “We wanted it to be named ‘The Office of Forcefully Disappeared People’, but it was not to be. We want an office that will find the truth and say it. But, under the OMP Act, if a criminal requests for his name not to be mentioned, the OMP will not do so, therefore it is useless,” she says. However, legal experts say, only certain aspects of the OMP’s investigative functions will remain confidential and that only pertains to specific testimony given under confidential cover. All other aspects of the Office and its documentation will be subject to the Right to Information law. Kanagaranjani continues, before the Act was drafted, the authorities gathered the affected people and asked for their views. However, she says, the Act was not inclusive of all their expectations. “It took them three years to set up the office, how long will it take for them to actually find the people who are missing?” she asks. The families are calling on the Government to release the list of names of missing persons. This was discussed by the Government at the Security Council meetings and security forces were told to look into the matter, says Kanagaranjani, adding that so far there had been no progress on the issue. She says, most people have evidence of the surrender of missing people, and she wished to know the truth about what happened to their relatives who were handed over to the Government. “The President says, there are no secret detention camps, but how can we believe that?” she asks. Speaking to the Sunday Observer, Chairman of OMP, Saliya Pieris says, the OMP will adopt a consultative process in its activities and take into account the concerns of the families of the disappeared and missing. “We will reach out to them for their views. However, first we will have an office to start the process of setting up the administrative structures of the OMP. We intend to reach out to affected persons in all parts of the country, as soon as possible,” he said, adding that, at this stage, they cannot surmise how long the process of tracing a missing person would take. Pieris says, it would take a while to establish their offices and recruit staff, as their intention is to establish an institution with a strong foundation, which needs strong and effective structures to be set up. Meanwhile, Devindran remains confident of the Government’s efforts to find his missing son. “I have written to the President and the Prime Minister about my son and they have responded,” he says. Following this, the Police have made inquiries about his son’s disappearance. “They told me they will try to find my son. I believe he is alive and will come back one day,” he says hopefully. Devindran says, he never fails to pray to Hindu Gods, asking for the return of his son. He rummaged through the sack carrying his few belongings, pulling out a picture of a Hindu temple, with a smile. “The Gods can hear us. When you pray at this particular temple, your wishes come true,” he says showing us the picture. Sagunthalai on the other hand says, she knows nothing of this OMP, and all she knows is that if the office is in Colombo, she cannot go there. “I do not know Colombo, I only know Killinochchi,” she says, bewildered. Pieris assures, the OMP will have several regional offices in the North and East. He says the specific areas are not decided yet, but will be done in consultation with all stakeholders, especially, the families. “At this stage, it is too early to set out the timeline, but opening these branches will be a priority,” he confirmed. Issuing the first public statement on behalf of the Office on Missing Persons (OMP), Chairman Saliya Peiris PC said the missing and disappeared cases the OMP will examine cover both civilians and combatants, including several thousand members of the Armed Forces, Police and Civil Defence Force, who have been identified as missing in action, in addition to members of various armed groups who were party to Sri Lanka’s conflict. The OMP consists of seven members, representing human rights activists, public servants and professionals, including a family member of a disappeared individual and a retired legal advisor to the Sri Lanka Army. The statement adds that given the magnitude of the problem and the complexity with respect to the multiple tasks required to search for the missing and the disappeared, the OMP will function as a permanent office. “In its design, the OMP is distinct from previous state mechanisms to deal with disappearances, which were temporary in duration, and served largely to document and recommend, as opposed to being a permanent institution tasked with investigation and tracing,” it says. Thus, OMP will ensure the efforts of its previous commissions to examine, and investigate disappearances will inform the design of processes and structure of the current OMP. Further, victim centeredness will be a guiding principle for the operationalisation of OMP. Finally, the statement recognizes the establishment of such a mechanism is long overdue and families have waited for decades, for answers as to the fate of their loved ones, which has deepened their anguish, frustration and trauma.